Nearly every Scottish bookshop seems to have at least one of their volumes. This, of course, does not make tracking down the scarce ones any easier. It does however allow an easy start to any collection – then you are hooked. I first started collecting Bannatyne Club publications when I came across a very dusty copy of the Registrum S. Marie de Neubotle on the top shelf of a Glasgow bookdealer’s. Apart from the dust it was in near mint condition, and very reasonably priced. From then on I kept an eye open for further publications by this club, and bought them whenever I could. A Maitland Club Registrum Epistcopatus Glasguensis soon followed, and I began collecting these too. There is a wide variety of titles, ranging from monastic chronicles to Civil War diaries, all of which are of immense value in the study of Scottish history. But it is not only the books themselves that are of interest – the clubs, their age, and the people behind them are all of interest too. The books are the product of a fascinating age, and I determined to try and get behind the societies, and understand why the seemingly disparate individuals listed as subscribers to each edition were members. Scottish society at the turn of the nineteenth century was a society in a state of flux. To the strains caused by the French Revolutionary and Napoleonic Wars were added those of rapid industrialisation and political change. Burgh government and the electoral system were notoriously corrupt – representative democracy as we understand it simply did not exist, and there were several radical campaigns for social reform. Scotland was a society desperately trying to come to terms with a modern world that promised much, but that had so far provided little. It is only natural that such a society should have turned to the past, not only as a means of understanding the present and where it might lead, but also as an escape from an increasingly confusing world. To fulfill that need, there were the novels of Sir Walter Scott, which presented the past in a readily understandable form, elegantly written, in an age when historical sources were imperfectly understood. They were immensely popular among a public starting to rediscover its own nation and past. As Scottish national consciousness awoke from its long sleep after the Forty-Five, a sense of loss, of things missing for ever, came to the fore. There was concern over the state of our national records – splendidly rehoused in Register House in Edinburgh, away from the damp, rat infested cellars of the Laigh Parliament House, but still in considerable disarray, and in poor condition. Steps were taken to remedy this under the direction of Thomas Thomson, appointed Depute Clerk Register in 1806. What caused concern was the lack of published sources for history – how could a past as complicated as Scotland’s be understood fully if the sources, whether in public or private hands, were not available in print? The original and perhaps the greatest solution to this problem was the development of publishing clubs, for which we owe Sir Walter Scott an enormous debt of gratitude. The early nineteenth century was a great age of book collectors and booksales. The vast flow of manuscripts and early printed works from the suppressed continental monastic houses helped to whet the appetites of collectors such as Sir Thomas Phillipps and Lord Spencer. This was fed by the Romantic movement’s enthusiasm for the once despised Middle Ages. It was an age when it was still possible to discover unknown mediaeval manuscripts – one of Scotland’s most important mediaeval collections of laws was bought from a bookseller’s stall in Ayr in 1824. Bibliomania (the fashionable disease of the age, just as appendicitis was to become under Edward VII), led to the formation of the Roxburghe Club in 1812, which existed to produce deliberately rare volumes for its members, all famous bibliomanes. Eighteen original members, later raised to thirty one, undertook to publish one work each for their fellow members. This guaranteed their rarity and their value. Sir Walter Scott was elected to membership of the Roxburghe Club in 1823 – but he already had in hand the formation of a Scottish equivalent. However, this was to be a club that eschewed exclusivity in favour of serving national ends, and was to be named the Bannatyne Club, after the compiler of Scotland’s most important collection of sixteenth century poetry. The first meeting of the Bannatyne Club was held in February 1823, in Edinburgh. From the start it was clear that this was to be no club for dilettantes, but a serious undertaking, both extensive and utilitarian in purpose. 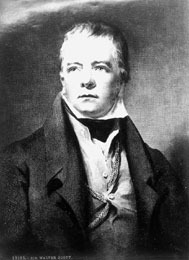 Sir Walter Scott became its first president, providing much of the original impetus that carried the club through forty-three years of existence and over one hundred publications. There was a social element too, as belonging to a club that the Author of Waverley belonged to carried enormous social cachet. However, this did not stop the Bannatyne from becoming much more than a pale imitation of the Roxburghe. The output in the club’s first few years was prodigious, ranging as it did from purely literary texts, such as the Buke of the Howlat, to Pitcairn’s Criminal Trials. The range was great, and the scholarship matched the club’s aims. All the great record scholars of the day, David Laing, Cosmo Innes, Joseph Stevenson and Thomas Thomson, contributed editions. This was no amateur’s undertaking such as the Rolls Series in England was to become – the Bannatyne Club’s output is still the basis for much of the Scottish history produced today. Many of their works have yet to be superseded. For researchers, using a Bannatyne Club chartulary or diary, well printed and laid out, on hand-made paper, makes their job a pleasure rather than a chore. Yet the Bannatyne’s success came not only from the utility of its productions, but also from its imitators. Glasgow was unlikely to allow its ‘auld enemy’ Edinburgh the lead in such matters for long. By 1829, the western answer to the Bannatyne had been founded as the Maitland Club. John Smith III, the Glasgow bookseller, became the club secretary and the prime mover in the club’s success. It too had been founded to publish items of Scottish interest, and if a distinct west coast bias is distinguishable in its publications, then who can blame it? Happily, given their rivalry, the clubs would co-operate where editions were to cost more than one could afford alone. Perhaps the finest example of this co-operation was the great Register of the Bishopric of Glasgow, published in 1843 and costing more than £200 by the original estimate. Publishing of source texts by clubs became the hallmark of Scottish historical publishing. The Bannatyne and Maitland clubs spawned many imitators, most doing a useful job. Lacking a government of its own to publish the great series of official editions of documents that most European nations were producing at this time, Scotland had to rely on the patriotism of her clubs. We owe much to the public-spiritedness of the individuals that made up the Bannatyne and Maitland’s memberships. Without them, Scottish history would be much more difficult to write, and infinitely the poorer. A complete set of the clubs’ publications is well worth hunting down. The fun of the chase beckons.